A £210m station which was due to help bring in people from abroad to the London 2012 Olympic Games may never have an international service. According to documents seen by BBC London, Eurostar has told the government it will not start services from the east London station. Other international train operators are in talks to use Stratford but this will not be until after 2012. 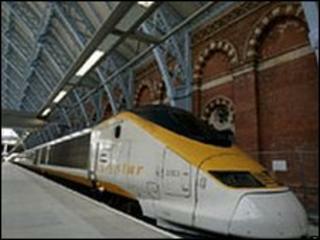 Eurostar said it would not run services to the station during the Games. The documents, obtained after a request under the Freedom of Information Act, are the minutes of a Department for Transport (DfT) meeting which was to discuss the the Westfield Shopping Centre in Stratford and Eurostar services. The minutes state: "Eurostar has decided not to commence international services from Stratford International Station." A spokesman for Eurostar said: "After the Olympics we are looking at whether there could be an opportunity there and we will talk about it later - it is too early to say." The meeting had been attended by Chris Mole MP, Michael Gutman, managing director of Westfield, John Burton, director of the Stratford City Project and Gareth Williams, a major projects manager from the DfT. The minutes also said Westfield was disappointed with Eurostar's decision and believe it will hamper local trade. Stratford International, built alongside the existing London Underground station, has longer platforms for the international services already built and it was hoped it would ferry in people from the continent for the Olympics. Southeastern services currently link the station to St Pancras International and during the Olympics, the company will run high-speed Javelin trains every seven minutes to Stratford. The Olympic Delivery Authority said during the games 40,000 people a day will catch the Javelin trains but international services would reduce capacity. BBC London's transport correspondent Tom Edwards said international operators are in "advanced discussions" to use the station. But he said the services will not begin until after 2012.